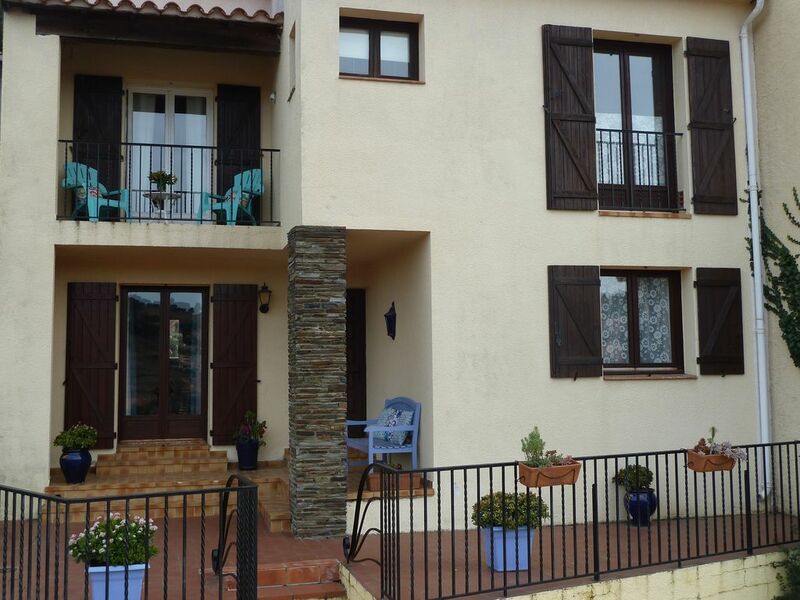 Our Large, spacious, bright, and colourfully-decorated house has wonderful hillside views of Collioure to the front. It has a large, sunny, secluded private terrace to the rear. The terrace is not overlooked to enjoy alfresco dining and sun-bathing. There is ample and safe parking within cul-de-sac for two or more cars. WIFI is available . throughout house. Our house is well-equipped with all mod-cons in fully-fitted kitchen (dishwasher, microwave, washing machine); tiled floors; large dining and sitting-room area; television & music system; BBQ; sun-loungers and outdoor dining table seats 8; 10 minutes' walk to Collioure village and its 4 beaches; located on quiet a cul-de-sac; three bedrooms, sleeps 6 to 8 people comfortably; infant cot available; 2 bathrooms with showers and two separate toilets; stairway to entrance; children welcome. Our house is our home-away-from-home and our extensive collection of music, books and films-on-dvd are available for your enjoyment. Off Season Arrival and Departures flexible. Towels & Linen Included. Collioure: A charming and enchanting port village, Collioure is the gem of Roussillon. It is nestled in an idyllic site on the Mediterranean, north of the Pyrennes and south of pristine Languedoc coastline. It has been a magnet for artists since Matisse settle here in 1905. Narrow cobbled streets, now crowded with galleries, restaurants and boutiques, lead back from its much-painted harbour, framed on one end by the small Eglise Notre-Dame-des-Anges and at the other by The Chateau Royal, an imposing castle built on a former Roman site. Anchovies are the specialty of Collioure, preserved in a traditional method for generations, and featured prominently in many local restaurants. There is also a wonderful local market on Wednesday and Sunday mornings; and wineries abound in the area. North to Perpignan: Perpignan, formerly the capital of French Catalonia, always seems buzzing with activity, is the largest city in the area with a population of about 160,000. Its many shops, sites and fine restaurants are patronised as enthusiastically by its well-heeled citizens as by visitors. A lively commercial city, its airport is served by RyanAir via the UK. Nearby Canet-Plage is a long, established seaside resort, with a casino and a long seafront lined with bars, restaurants, shops and apartments. St. Cyprien sports a 3km sandy beach, harbour and marina, Aqualand and an international standard golf course. Argeles-Sur-Mer is an old Catalan village which is animated all year round with its colourful markets and games of petanque (bowls) under the plane trees, as well as the dancing of the Sardane on Mondays during the summer. South to the Border; Barcelona: Collioure is located about 2 hours north of Barcelona taking the motorway, or about 3.5 hours along the coastal route. Barcelona is served by most international airlines, including some of the UK 'cut-price' airlines. Port-Vendres, about 5 miles south along the coast from Collioure, is home to many fishing boats and has a well-equipped marina. Banyuls-sur-Mer, with its pale pink and white buildings and shady squares feels distinctly Catalan, and is the home of the sweet, dark brown aperitif, Banyuls, first made there by the Knights of Templar in the 13th century. Cerbere, a quaint border town, huddles around a small pebbly bay. A village not to miss is Ceret, known throughout France for the delicious plump cherries which grown in the local orchards. There are also a number of fine restaurants in Ceret and a Museum of Modern Art. Nearby Le Boulou and Amelie-les-Bains are spa resort towns nearby. Hiking and biking treks throughout the area & skiing in winter. We are a couple in our mid-50's (yes, the photo is from a long time ago ...) We fell in love with Collioure on our first visit more than fifteen years ago. We travel extensively and are always happy to return to Chez Collioure, our home-away-from-home as frequently as we can. Chez Collioure is a large 'upside-down' house - that is the main living area of kitchen and sitting room is upstairs with access to the terrace garden to the rear and views over the village to the front, while the entrance level contains two bedrooms and a shower room with washing machine and separate toilet. There is a third bedroom upstairs as well as another bathroom and toilet. The layout of Chez Collioure makes it especially ideal for two families holidaying together (or a family with a few children and/or grandparents). The two level layout allows a mixture of privacy and sharing that make a holiday vacation enjoyable and relaxing. Fully stocked kitchen with a complete set of dinnerware for 8 persons. Many books about the area as well as novels and history, cookbooks, etc. Extensive selection from all genres of music. Three level terraced garden to rear. Deposit Required (returnable after inventory on departure). Weekly rental; normal availability Saturday 1600h to Saturday 1000h. Flexible Arrivals/ Departures Available. Periods of rental exceeding 2 weeks outside high season: price negotiable. Rental payment and deposits accepted in Pounds Sterling and Euros and Us-dollars. Special Rate for Long Term Autumn/Winter Season Available. Short Lets Also Possible; Minimum of 3 Nights. Please contact us to discuss your requirements. Re: Television: New Decoder means greater selection of French channels now available as well as some international English and other language channels like BBC World! The house is big, on two levels with terraces at front and back. The house is charming , old French style and clean. We were a party of 6, including 3 kids aged 8,7 and 3. The kids had lots of fun on back terrace running around. Many a pleasant evening dinner there. It's very peaceful and lovely. Millions of stars at night. Not a noise. It's a 15 min walk from Collioure (with 3 kids so maybe slower pace for us!) The walk was a bit off putting coming back as it's going slightly uphill. Collioure is very busy in the summer, impossible to park anywhere so you have to walk. We shopped at the hypermarché Intermarché on Argeles , 15min drive. We missed a boulangerie super close, there was one but again 15 min walk there and back. There is everything you need in the house, cooking utensils, Baby cot if you need one. Be prepared for mosquitoes! Everywhere in town at dusk. Collioure has 3 small 'town' beaches, very small and crowded. If you want big beaches, it's a 10 min drive. Collioure is full of restaurants , but you might need to book or go there early if you are a big group as the good ones are packed! The house is well situated and the garden is private. There was always a welcome breeze in a very hot week. We had everything we needed for our comfort and an excellent selection of books and DVDs too. We could walk down to Collioure along the ravine in 15 minutes where the beaches are fabulous and there is a great choice of restaurants. We enjoyed outings to Elne and Ceret but mostly we relaxed and enjoyed the house and Collioure. We spent a perfect week at this charming house - we were glad to discover that everything is as pretty as on the internet photos. Also, the house is very well equipped with everything you need, has a large terrace with natural shade in the mornings and later afternoon (and at midday you can roll out a sunroof). Nice stroll to Collioure, about 10 minutes, and you don't have to worry about parking. Lots of art and jazz and cooking books in the living room... Our dog enjoyed it, too; it's great that he was allowed to come as well! A lovely home in coastal paradise! We spent a lovely anniversary week at Chez Collioure – and we’d go back in a heartbeat. This is a very comfortable, attractive and welcoming home on a quiet cul-de-sac overlooking vineyards and hillsides. Chez Collioure is equipped with everything anyone would need for an extended stay which makes it a perfect base from which to explore this fascinating town and the surrounding region. The owners have supplied a great array of books and music to enjoy in the quiet times. There’s so much to do within walking distance when you decide to leave the comforts of Chez Collioure to explore the town and its beautiful waterfront -- cafes, restaurants, historic sites, artist studios, a castle -- and the countless tempting attractions beyond including wine tours, pretty villages, museums, stunning land and seascapes at every turn. Spend just an hour by the waterfront and you’ll understand why Collioure has inspired generations of artists including Matisse, Derain and Braque, to name but a few. In Collioure, don’t miss the cafe "Les Templiers" and its walls of art works given in payment for food, drink and lodging by artists who frequented/frequent this gorgeous spot. And for a change of pace, the Museum of Modern Art in town is definitely worth a vist. The owners of Chez Collioure provide their guests with lots of information – local maps, tour guides and personal recommendations – and they clearly want you to enjoy their lovely home and your visit to wonderful Collioure. We enthusiastically recommend this idyllic property. We visited Chez Collioure for three months in the off-season and found the house and the village to be just as advertised. The house was clean, comfortable, well appointed. The property manager, Louise, and Greg and Joan, the owners, were courteous and efficient when dealing with any questions or concerns. My wife and I lived on the second floor which left the first floor available for our guests. I would recommend this property to anyone who either has a car or likes to walk. We walked into the village at least twice a day and into the hills often. The house is close to the train and bus stations allowing us to visit other towns in the region. Collioure, France: A charming and enchanting port village, Collioure is the gem of Roussillon. It is nestled in an idyllic site on the Mediterranean, north of the Pyrennes and south of pristine Languedoc coastline. It has been a magnet for artists since Matisse settled here in 1905. Narrow cobbled streets, now crowded with artisan galleries, beach-front restaurants and boutiques, lead back from its much-painted harbour, framed by the small Eglise Notre-Dame-des-Anges and by The Chateau Royal. Our house here is in a quiet cul-de-sac, surrounded by vineyards, and is only a few minutes' walk along the riverbank from the village centre. There is a beautiful drive along the rugged coast through Port Vendres, Banylus into Spain and the Dali village of Cadaques. There are vineyards for wine-tasting, Cathar Castles for history buffs, and pretty harbour towns for relaxing. There are fabulous walks into the Pyreness mountains. Golf: Golf in the Area: There is a 27-hole golf course in St. Cyprien, which is about 15 minutes by car. It costs 31 Euro for 18 holes or 18 Euro for 9 holes; a half-set of clubs (6) costs 7 Euro. They also offer week-end and weekly rates. This is the closest to us; there are about half a dozen courses around Girona, Spain which is about one hour south on the motorway. Ski: The many ski resorts of Andorra are only a few hours picaresque drive away! Bath Towels and Bed Linen Included. OFF SEASON RATE JANUARY-JUNE AND OCTOBER-DECEMBER 900 EURO PER WEEK. OFF SEASON DAILY RATE 175 EURO THREE NIGHT MINUMUM. HOUSE ALSO AVAIALBE FOR LONG TERM RENTAL, RATES NEGOTIABLE.